Glamorous Kate pays special tribute to Bhutan with orange Beulah dress | HELLO! It was all eyes on the Duchess of Cambridge, née Kate Middleton, as she stepped out for the UK Bhutan Reception at the Taj Tashi Hotel. 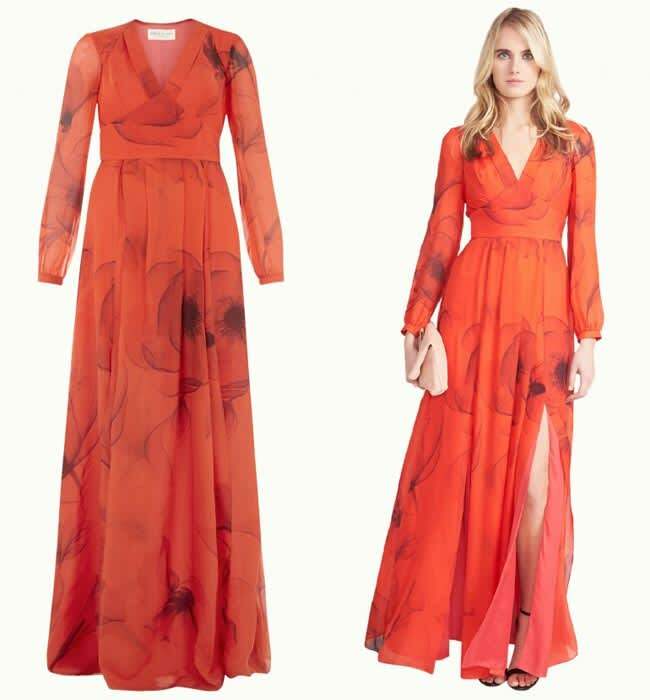 The royal was sporting a poppy-printed, elegant silk chiffon gown from Beulah. While the dress was beautiful and a great choice for the stunning Duchess, careful thought had also gone into the outfit choice – the poppy print was a nod to Bhutan, as it is their national flower. The dress has a price tag of £745 and is titled Juliet. Beulah is one of Kate's favourite favourite fashion brands, so it's no surprise that Kate wore one of their dresses during the tour. The ensemble was a contrast to Kate's earlier look – for a six-hour hike, the 34-year-old had opted for comfortable and easy-to-wear gear. But the ever stylish royal obviously managed to make casual look chic as she embarked on the gruelling trek. Kate, who is naturally sporty, looked more than ready to take on the challenge. The Duchess wore jeans, a white shirt and a dark brown leather waistcoat designed by one of her favourite outdoor British brands Really Wild, which she has worn in the past. She completed her outfit with her trusty Penelope Chilver riding boots, another item she has owned for some time. Despite the difficult trek, not a hair was out of place for the Duchess, who topped off her look with black Ray Bans.